This post marks the end of a chapter. This project began in the fall of 2014, when I noticed that photos of the elderly are typically passed over in favor of attractive young people and children. You can read more on that here, with part one of a fourteen-part series. I have been regularly visiting the Belknap Country Nursing home in New Hampshire, with the intention of capturing something special about each person. 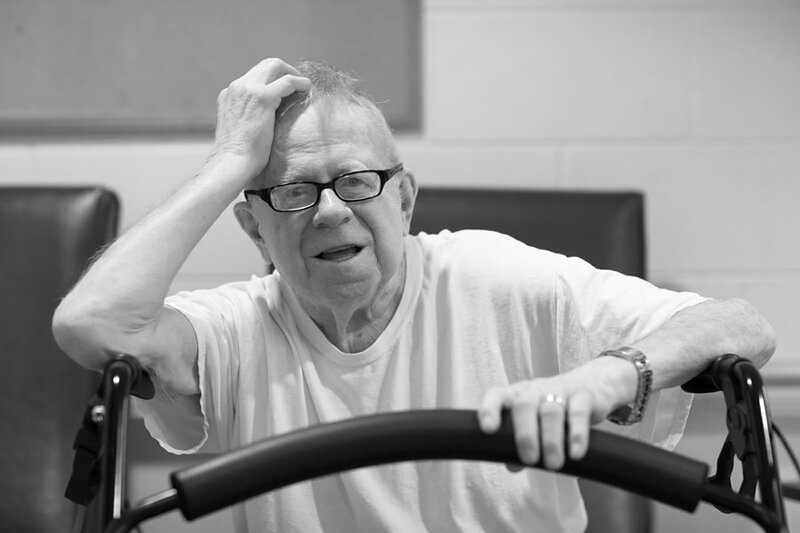 I have visited the nursing home 17 times, making more than 200 portraits. It was important to be able to return many times. Scheduling was often complicated, also finding opportunities while I was there. Everyone has different moods on different days, and the elderly sometimes have irregular sleep patterns and sometimes dementia. “How do you want to be photographed?” It’s a question I ask everyone I photograph. I found that many people could not answer, so I always started with dignity. I did not try to change anyone’s mood, but tried to recognize when they were ready to share something of themselves. 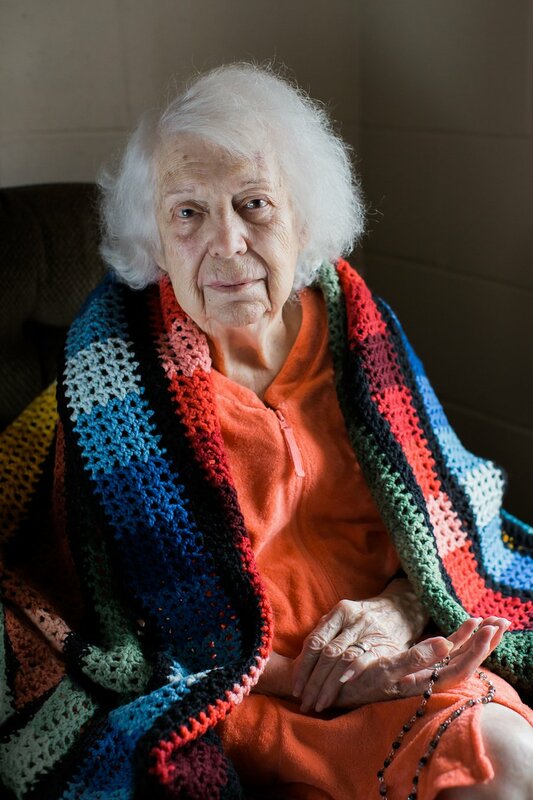 “My mother made this afghan for me.” – Irene, 96, who said no to portraits every time I saw her, until the last day I visited. Bertha loves to sew, crochet and knit. 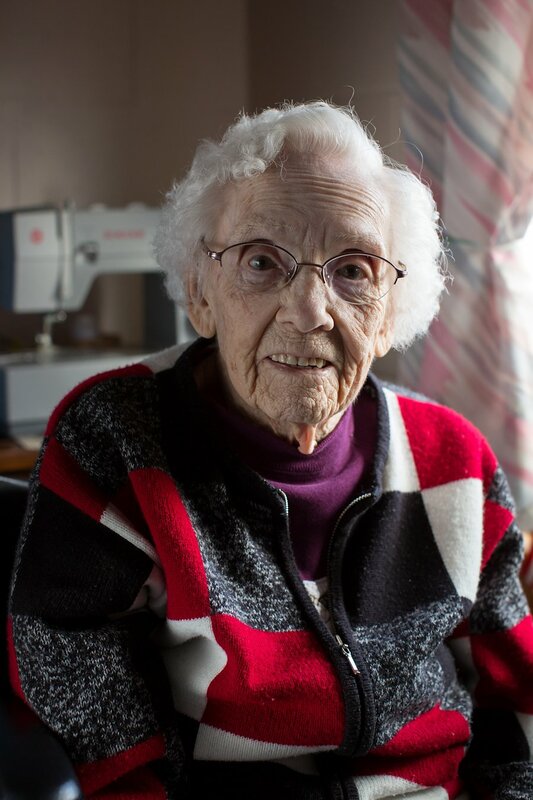 At 95, she still teaches a knitting class. What’s next? I am reaching out to some other facilities, and am looking at continuing this work with other demographics of elderly. I would also like to present this work in a public exhibition, and I am exploring possibilities for that. Thank you to the many people who helped with this project and supported me along the way. Thank you to Annette Griffis, social worker at Belknap County Nursing Home, who coordinated this project, and spent many hours helping. Thank you to the staff of the BCNH, who always welcomed me and went out of their way to help. Thank you to my assistants, Kree Woolley, Mandy Gennaro, and Abi Sutcliffe. Thank you to my husband, Matt Kizer, who supports every idea I have (except for my idea of having miniature donkeys!). Thank you to the families and guardians of the nursing home residents for trusting me to make these portraits, and thank you to everyone who follows this project. I appreciate your interest.